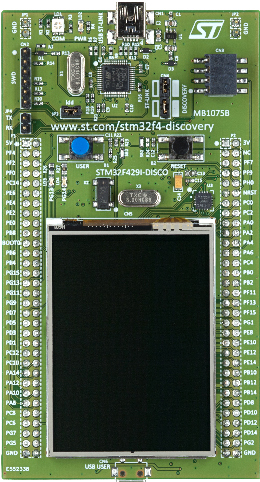 STM32F429 Discovery board has external 64Mbits or 8MBytes SDRAM chip ISSI IS42S16400. STM32F429 has a FMC (Flexible Memory Control) peripheral to driving external SDRAM with hardware. FMC hardware is able to store up to 32bits variables at same time. Note: This library does not work on STM32F4 Discovery, because this MCU does not have FMC peripheral. 8MByte is a lot for that microcontroller, but can be very useful if you are working with LCD (storing images, …) which can increase LCD’s refresh rate. In Standard Peripheral libraries pack is also included FMC example for SDRAM. I modified settings for our board and make a simple library. Function returns 1 if sdram was properly initialized, to check this, function just simple write data to SDRAM’s location and read it back. If they are the same, everything is OK.
For writing data to SDRAM I made 3 functions.